Due to a considerable increase in air traffic, it was decided a new airport would be needed to relieve the pressure on Istanbul Ataturk Airport. A site was chosen in Tekirdag and construction commenced in 1995. The new airport was planned to be in service to International air traffic with no curfew in place. 24 hours a day, 7 days a week. 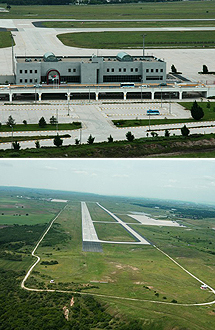 Tekirdag Corlu Airport was opened in 1998 by then President Suleyman Demirel and has been in service to both Civil and Military Aviation needs. It is located 15 km. from the central district of Corlu. If you require reliable, comfortable and affordable transport to and from Tekirdag Corlu Airport you can make a booking in a few easy steps by clicking on “Transfer Planning”. If you wish to make a telephone booking, you may speak to our dedicated and efficient call center staff members on +90 216 688 54 00. Please click for Tekirdag Corlu transfers.